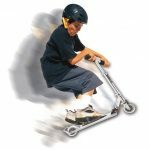 The Y Fliker F1 Flow Kids Drifting Scooter is the original freestyle scooter. It provides endless drifting and carving action for kids aged 5 and above years. It has enhanced ABS footplates and quick response brake that provide plenty of stopping power as well as grip. Such a combination ensures you kid enjoys a stable and safe ride. To ensure the wheels are rolling, you should push down via the legs and twist your hips. Riders can self-propel themselves to top speed as well as pull off daring slides and tricks without the need to put their feet on the ground. Riding the Y Fliker F1 Flow Kids Drifting Scooter is definitely one the most interesting and fun ways to move around on three wheels. That is for sure. This scooter brings with it a real-time response hand brake that provides kids with increased control. Additionally, it guarantees a safe and fun ride. Anytime your kid is done with the Y Fliker, you can fold it effortlessly and then store it. The scooter’s patented technology, sleek and lightweight design combines perfectly with performance rated wheels to allow free-style ride and smooth drifting action. The only cons of this scooter is that it might be somewhat small for those kids with a bigger physical size. The fact is scooters have been around for more than 20 years now. However, their styles and forms have drastically changed in the recent years. Scooters of today are typically made of aluminum or plastic. 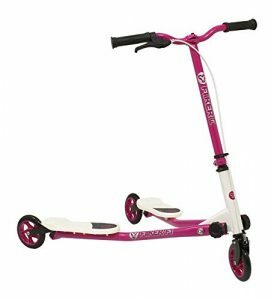 One of the main reasons you should purchase the Y Fliker F1 Flow Kids Drifting Scooter is the fact that it encourages your kid to take part in physical activity. Secondly, it helps the young ones develop skills that will be handy when it comes to cycling in future. With any type of scooter, it’s always important to buy some protective gear for your child. That will go miles in making sure that he or she is safe when riding. Fortunately, both in offline and online retail shops, fancy armbands, and helmets exist for you to choose from. When making a purchase, it’s prudent to order everything all at once so that your little one can enjoy the new adventure immediately he or she unwraps paper from the box. Another important question you need to address is whether your kid is ready for a scooter! Always remember that each stage of a kid’s development has to be a special memory – from when he or she utters the first words, to first steps to when they push off and even learn to ride their scooter. Therefore, before making a purchase for a scooter, you must make sure that the young one is ready to undertake a ride. You shouldn’t be in a rush because each of them develops differently. The rule of thumb is for them to have a fun experience while at it. By the time the kid is 2 – 3 years, he or she should be ready to ride a scooter. Nonetheless, if you feel that your kid has the ideal physical size and motor skills, then you should go right ahead and introduce him or her to a scooter. 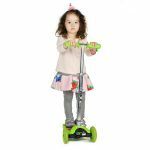 The Y Fliker F1 Flow Kids Drifting Scooter is a highly exciting and innovative three-wheeled scooter, which enables young ones to get outside. It’s one of the best ways for little ones to get active. It features a side-to-side and cool ride that provides a unique riding experience from the other conventional kick scooters. One of the best attributes and a reason you should purchase this scooter has to do with its effortless and stow folding system that’s ideal for families on the move. Its reinforced but lightweight steel frame makes it effortless for children to handle yet tough enough to last for many years.